The Second Edition of Giant Molecules presents an introductory textbook on large molecules that exhibit specific physical and biological properties related to their size, orientation, and environment, making this subject accessible to students from high school to universities. Written by Charles Carraher, author of more than forty books on the subject, this up-to-date guide presents material in an integrated fashion, marrying fundamentals with illustrative applications. The text assumes no previous formal scientific training, and includes new and updated questions and answers, a glossary of relevant terms, bibliographies, visual aids, and related Web links in every chapter. 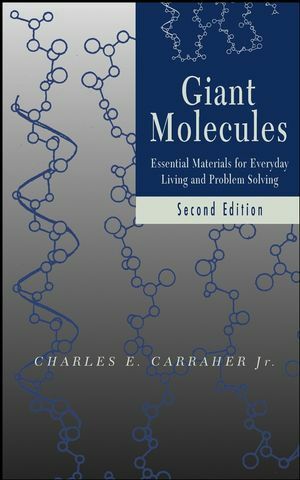 Giant Molecules, Second Edition will appeal to individuals who have a personal or professional interest in polymers, as well as to college chemistry and materials science students who study polymers. CHARLES E. CARRAHER Jr., PhD, is Professor in the Department of Chemistry and Biochemistry at Florida Atlantic University in Boca Raton, Florida, and is associate director of the Florida Center for Environmental Studies. The Building Blocks of Our World. Introduction to the Science of Giant Molecules. Relationships Between the Properties and Structure of Giant Molecules. Physical and Chemical Testing of Polymers. Paints, Coatings, Sealants, and Adhesives. Nature's Giant Molecules: The Plant Kingdom. Nature's Giant Molecules: The Animal Kingdom. The Future of Giant Molecules. Appendix 1. Studying Giant Molecules. Appendix 2. Electronic Web Sites.